Trojan (alias Ilion) Historical facts vs. “Acces”, Pseudohistorians-“Scholars” etc..
All Fine Arts(:Sculpture, Architecture, Poetry, Theater), Geometry, Philosophy, Mythology, Astronomy, Mathematics, Music, Rythmic, Retoric, Pharmacology(=Medicine), Physics, Language-etymology, , (as a clue to analyze words & improve real historical facts),Literature(=λογοτεχνία) and finally MYTHOLOGY, wich is COSMOLOGY, as well, contaning ALL the above…THAT`s HOW The Ancient HELLENIQUE(Greek) Language was CREATED: INTERRELATED with,(as said above): All Fine Arts(:Sculpture, Architecture, Poetry, Theater), Geometry, Philosophy, Mythology, Astronomy, Mathematics, Music, Rythmic, Retoric, Pharmacology(=Medicine), Physics, Language-etymology(it`s the Key to analyze words & improve real historical facts), Literaure(=λογοτεχνία= the art of logos= speech and word), as: HOLISTIC and COMPLETE ONE! Firstly we intend to examine the ancient evidence on the way the Ancient Macedonians were defining themselves in reference to their own identity. Concerning their own beliefs about themselves we shall review the available evidence coming from the ancient sources, both Literary and Archaeological. Macedonian king Alexander during his speech to Atheneans. Essentially we have a clear confession that Alexander considers himself a Greek. The temple of Artemis was in Ephesus of today’s Turkey. Called Artemision and was built in 440 BC Considered one of the Seven Wonders of the ancient world. Noteworthy is the fact that it took 120 years to be completed and was originally started by the king of Lydia, Kroisos. Pausanias says that the cult of Artemis of Ephesus was founded by natives of Asia Minor. Today the remnants not resemble anything in the magnificent temple there.The Temple was built of Pentelian marble(fromthe mountain of the best marble quality in Attica county, where Athens is lying) and limestone materials carried by ship over from neighboring Penteli. Somewhere 120 marble columns supporting the main part of the church. Each column had a height of 20 meters. Huge boulders were transported there with pulleys and connected with metal pins. After the completion of the roof decorated artists building with wonderful carved scenes. In the middle of the temple was a marble statue of Artemis. 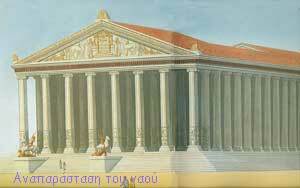 The temple was one of the greatest of the classical world, much larger than the Parthenon in Athens was built later. The base of the foundation had length 131 meters and width 79 meters. The only restored columns that exists today. But still more glorious ruins of the city, a theater, a library, baths and many other public buildings. Two hundred years later, in 356 BC The temple was destroyed by fire. Fire someone put the Irostratos, who wanted in this way to become famous(!). 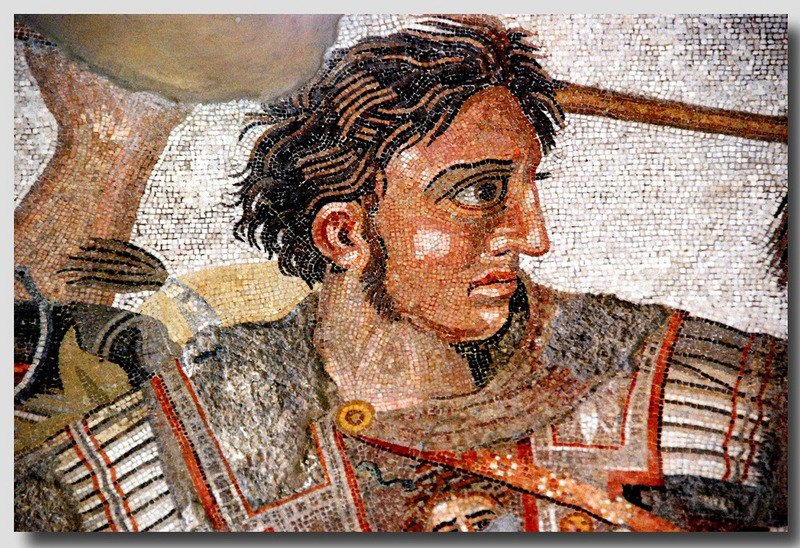 By coincidence, the day of the destruction of the temple, Alexander the Great was born. Later, Alexander visited Ephesus and gave the order to build the temple again in the same position. The temple of Alexander survived until the 3rd AD century. With the passage of time the mud engulfed the port of Ephesus and the city ended up insignificant! The Goths then ransacked the temple and floods completed the destruction Today what remains of the temple in Ephesus are few boulders foundations and restored only one column! The temple of Artemis (Diana in Latin), as it should have been 600 BC It had 120 columns of marble and were decorated with beautiful sculptures. Croesus was the last king of Lydia, a region of Asia Minor. It was known for its many riches. 560 BC commanded to build a magnificent temple in Ephesus. The enormous peristyle, which formed four great porticoes around the courtyard, consisted of 60Doric columns. In the round chamber which Heuzey named the ‘tholos’ to the east of the propylon, a dedicatory was found. 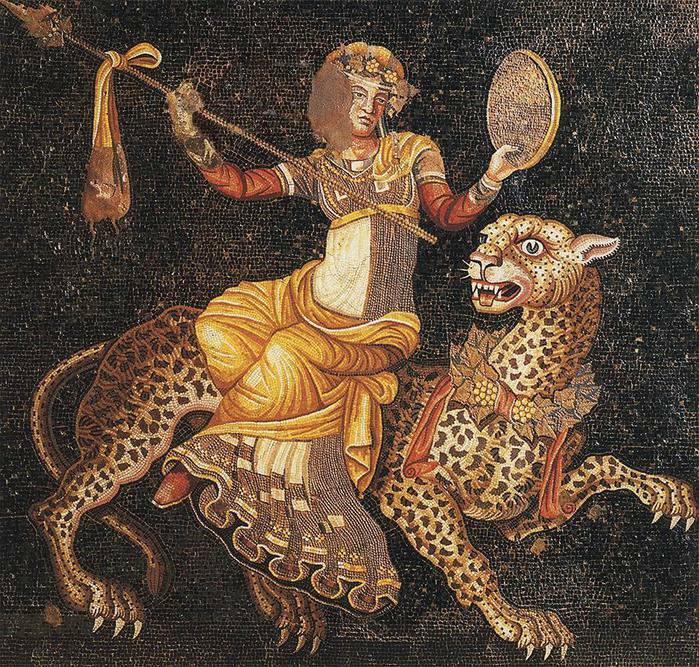 The 5 rooms on the south side had mosaic floors, one of which – executed in pebbles – survives in excellent condition. 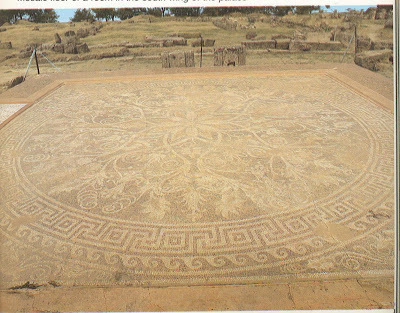 You can see one the Greek key pattern surrounding the mosaic floor. 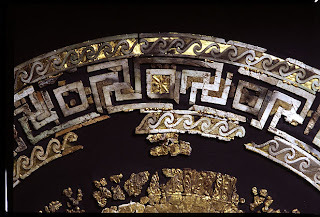 Finally, the most important archaeological found that combine Greek key/meander and vergina sun/star is the Ivory Shield that was found in pieces in Philip´s tomb at Vergina archaeological site. 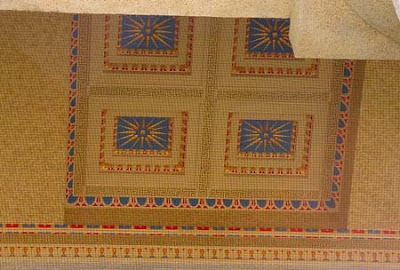 The arduous process of restoration took several years – it is indeed a unique masterpiece of the 4th century B.C. 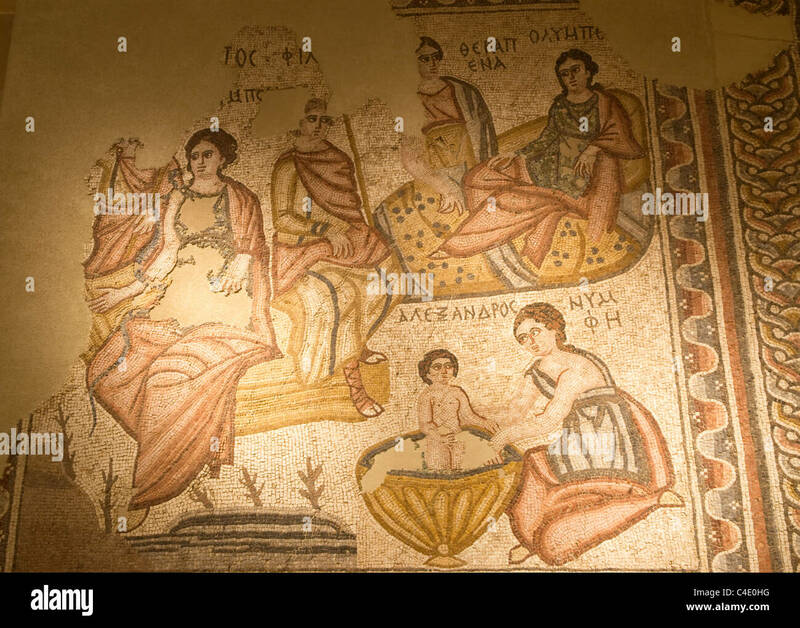 You can see clearly these pan–Hellenic symbols in the picture at the beginning of the article.References 1- Times of Remedies and Moon Phases by C. M. Boger, page 132 2- Sally Hutchison Ceely-Geometric Style in Art, Wisconsin Academy oj Sciences, Arts and Leiters,Vol. 71, Part 2, 1983, page 3 3- .The Way of the Labyrinth by Helen Curry, pages 21-23 5- “Vergina Sun” or the “Rays of the Sun God” ? 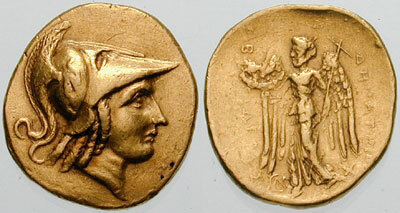 The obverse shows the diademed head of Alexander the Great (r. 336-323 BC). This posthumous and idealized portrait includes symbols of Alexander’s deification, one of which is the ram’s horn, characteristic of the Egyptian god Amon. 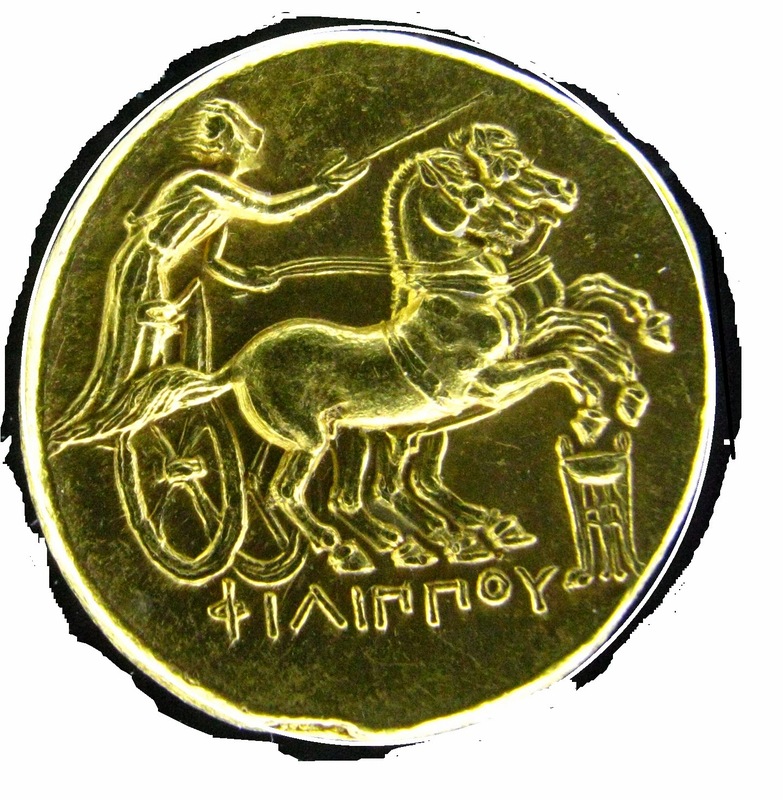 This iconography derives from the type of coin introduced by one of Alexander’s immediate successors, King Lysimachos of Thrace (297-281 BC). 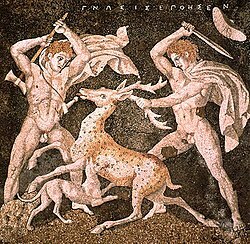 The reverse shows a hunting scene, with the hunter’s spear piercing a wild boar that is being attacked by two dogs. The legend “King Alexander”, which appears to the left and above, identifies the hunter. The “medallion” is part of a treasure including twenty similar pieces found in Aboukir, Egypt, in 1902. The designation “medallion” is purely a matter of convention based on the piece’s morphology and size, as the use given to such pieces cannot be definitively established. 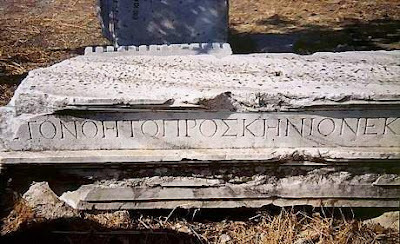 Ancient Dion (Genetivus of Zeus 3th declination) was a centre of the worship of Zeus and the most important spiritual sanctuary of the Ancient Macedonians. 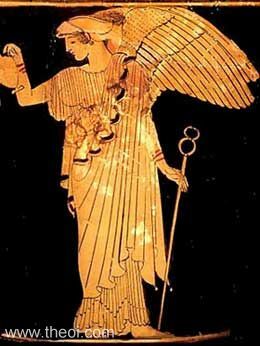 What symbolizes the Vergina Sun? 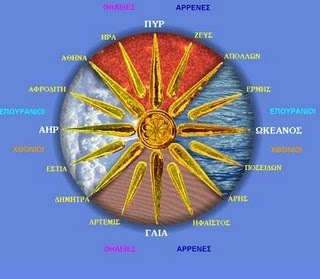 The Vergina Sun (otherwise “Star of Vergina”) is a symbol widely used by the ancient Greeks. 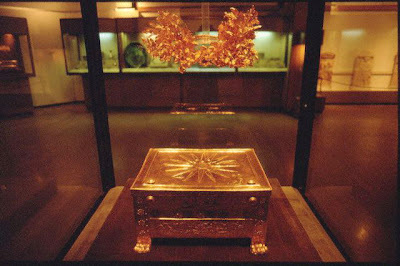 Although the Sun of Vergina is a symbol of Pan, became famous because of the Macedonians, who use it as a symbol of the dynasty Argead the Kingdom of Macedonia. 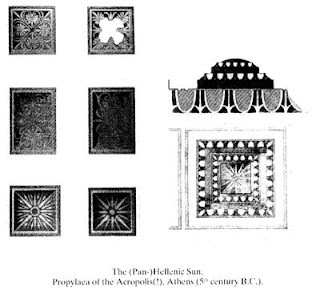 The typical Vergina Sun, consists of 16 rays. We can also see him with 12 or even eight rays of the sun. The sun with sixteen rays represents the following: The four rays represent the four elements of nature, LAND – SEA – FIRE – AIR and the remaining 12 rays represent the 12 gods of Olympus. The Vergina Sun was a common symbol of ancient Greece and is found in coins, pottery, murals and statues, long before the Macedonian kingdom and the dynasty slow. 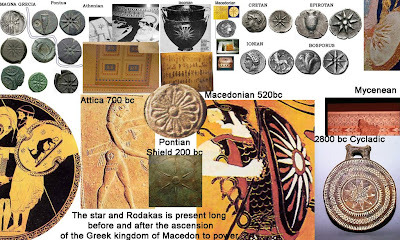 Dekaexasteroi and Ochtasteroi Suns presented in Macedonian and Hellenistic coins and shields Period. There is also number of Athens illustration Soldiers carry a sixteen identical symbol on their armor, from the 6th century, as well as coins from the island to the mainland Greece, as in Corfu, 5th finding century, Locris, 4th BC century. After the union of the Greeks under the leadership of Alexander the Great, the Vergina Sun was the main symbol of Greek ethnogennesis. The symbol of the Sun of Vergina was one of the symbols of ancient Greece, long before the rise of the Greek kingdom of Macedonia. Dozens of coins, etc. pots bearing the symbol found in many parts of Greece, outside of Macedonia. “Your ancestors, having campaigned in Macedonia and the rest of Greece, they hurt us while they had wronged me previously; because became leader of the Greeks and because I want to punish the Persians I spent in Asia, because you made the beginning (injustice) . Because you helped them Perinthians who unjustly wronged my father, and in Thrace, who we dominated the Ochus sent power. And when my father was murdered by the conspirators, that you set up,as you boasted, that you killed Arsi with the help of Vagoou and seized power, nor equitable nor according to Persian law but beeing unfair to your own Persians and sending in my guilt to the other Greeks hostile letters to fight me, and sending money to the Spartans and some other Greeks who were from other cities sometimes not accepted while the Spartans took them, and when your envoys corrupted my friends, and the peace that succeeded the Greeks attempted to disperse, campaigned against you, because you have done the principle of hatred. And I defeated in battle your first generals and your princes and now you and your powers and possess my country given to me by the gods, those of them who helped you and not been killed in battle, but fled to me, all these I am taking care of and they are with me not unwittingly but aware and conciously will join my campaing against you. And because I’m dominating the whole of Asia, come near me. And if you are afraid lest, after you come, you suffer something bad from me, send some of their friends to get sworn assurances. Once you come to me, ask and get your mother and wife and children and everything else you want. The first settlements of Ephesus were made by the Ionians in the 11th century BC, when Androcles (from Athens), established a coastal town which was located 1.5 kilometers away from Artemis’s Temple. According to legend, he had been advised to establish a city at the place which would be shown to him by a fish and a boar. During Androcles’s reign, Ephesus became a member of the Ionian League and his descendants ruled the city for a long period. As years passed, Ephesus grew to a prosperous city and it was turned to a trade and banking centre thus ruled by rich merchants. This attracted the interest of the king of Lydia, Kroisos, with whom Ephesus had already commercial relations. Lydians conquered Ephesus and made the habitants to the inland close to the Temple of Artemis. The Lydians ruled Ephesus until the Persian Wars when the Persians took it over. However, Alexander the Great set the city free in 334 BC and after his death it was ruled by Lysimachus, a descendant of Alexander the Great. Artemis was mainly known as the goddess of hunting. She was born by Leto and Zeus. Apollowas her twin brother. 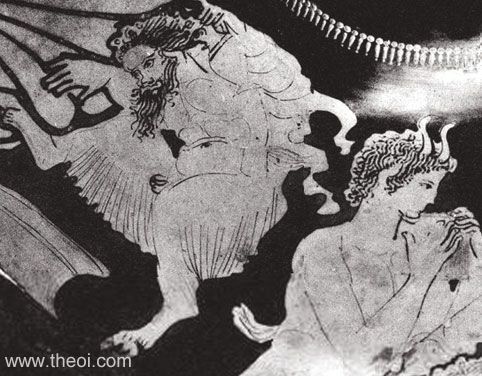 According to the myth, Zeus had desired to lay with his cousin Leto. 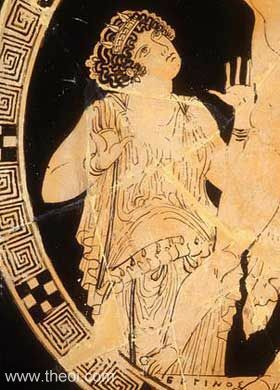 After their coupling, Leto was pregnant but Hera, the jealous wife of Zeus, had punished her by prohibiting any place of the earth, seen by the sun, accepting her giving birth to her child. After long wanderings, Leto resorted to her sister Asteria, who had become a floating rock in order to avoind Zeus’s pursuing. Asteria, anchored in the bottom of the sea and accepted her sister who initially gave birth to Artemis and the goddess helped her mother to give birth to Apollo too. Once born, Artemis was said to be the embodiment of the moon and Apollo the embodiment of the sun. Artemis is also known as the mood goddess as well and it was said that the silver belonged to her and that Artemis owned a silver chariot which she used to ride at night shooting arrows of silver light. Artemis had decided to stay unmarried and preferred to live in the forests accompanied by young girls called dryads. Known as the Lady of the Wild, the wild animals were sacred to her and she punished the people who killed more than that they could eat. 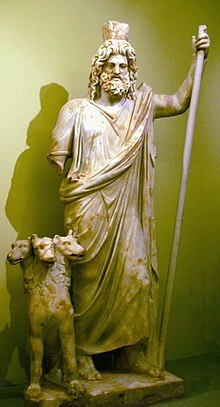 The Ionians named that goddess “Artemis” and when the Lydian king Croesus invaded the city, the temple, which was surrounded by walls and a wooden statue devoted to Artemis had been placed in it, was destroyed by a flood. Croesus started constructing the new stone temple at the same position and adorned it with columns, in the 7th century BC. Artemis Temple (also known – many centuries later – ,as the Temple of Diana) was included among the Seven Wonders of the World. It was 115 m long and 55 m wide. Its construction lasted 120 years and its architectural order was Ionic Dipteros with double column-rows on each long and triple column-rows along the wide sides. 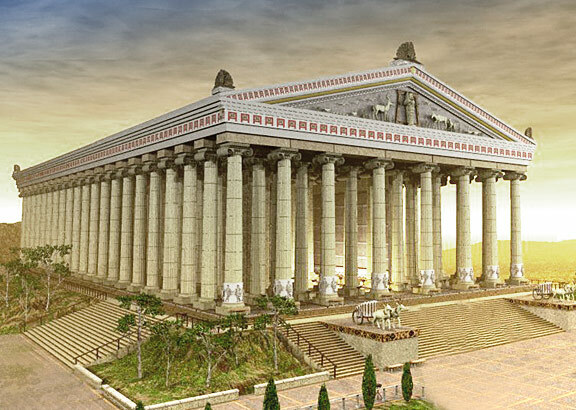 The Temple of Artemis consisted of 127 columns with a diameter of 1.20 m and 19 m tall. As the city was located by the river Kaystros (nowadays known as Kucuk Menderes river) which cut off the outlet to the sea with alluvial sand, it created a marshy earth which in turn created an unhealthy environment for the population of Ephesus. Lysimachus decided to transfer the city to the valley situated between the mountains Koressos and Pion (nowadays known as Bulbul andPayir). He also fortified the city with a wall 9 km long. He named the new city after his wife,Arsinoe. The city grew again in a rich trade centre and several public buildings such as stadiums, gymnasiums, theatres etc were erected in it. After Lysimachus’s death, the city was ruled by the Egyptians and the Syrians and it was conquered by the Romans in 190 BC. Ephesus was ruled by the Romans indirectly, throughPergamum and started blooming during the Augustan Empire era. It became the capital of the Asian province of the Roman Empire and it grew to the most important trading centre of Minor Asia, inhabited by 250,000 people. Most of the monuments, that have survived nowadays, date pack to the prosperous period. The Goths invaded the city in 263 Ad and they destroyed both the city and the temple of Artemis. 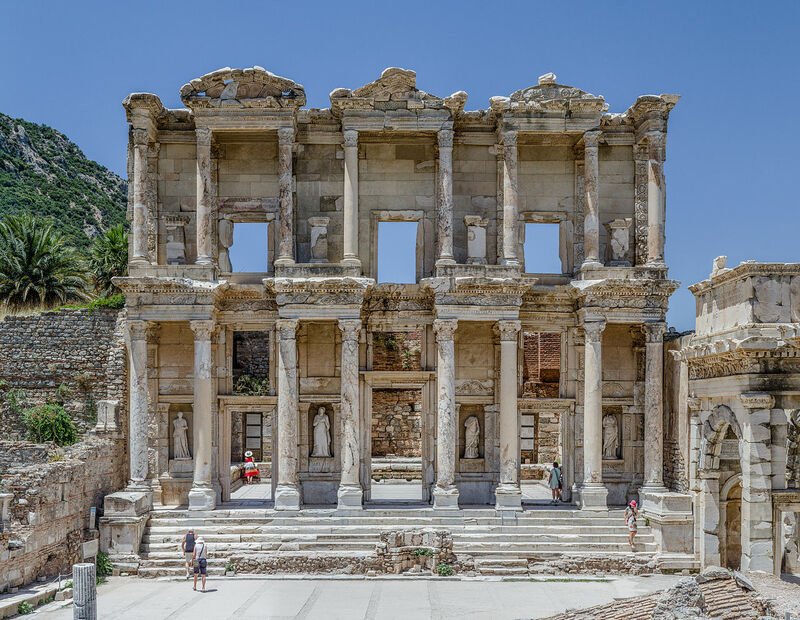 Ephesus declined since then and even though it was rebuilt, it never regained its old splendor. During the Byzantine era, Ephesus was a very important city (5th-6th centuries AD). A big part of the city was rebuilt by Constantine I. In 614 AD the city was destroyed again due to an earthquake. Continuously, the harbor of the city turned to a marshy are once preventing the inhabitants from accessing the sea and carry on their trading activities. The harbor decline and the Arabic invasions made the population to move towards a hill where they would be protected. As they had no more a connection with the sea, the city declined and it was turned to a small village, occupied by the Turks in 1390. Finally, the city was abandoned during the 15th century as there was no possibility to regain its past flourishing. 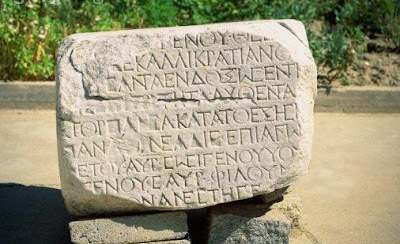 Hellenic scripts of what is remaining now from Ilion or Troja now days..
Danaoi and Achaoi (named the troups of both Doric, Ionic, Aiolic,& Achaic in dialect kingdoms – Troja and Ephesos Ionic dialect, Pergamos & Alicarnassos: Doric), who made the campaing against Troja – meaning war between Greeks..The Athenians (in Attica county,- Ionic Dialect), Spartans, Mychenians(Agamemnon), Achileus ,- the leader of Myrmidons & the Idol of Alexander the Great, 900 years later, Ajax(Aias) – king of Salamis, son of Isione, sister of Priamos of Troja – against his own uncle(!!). This war was not of course for the beautiful Helenas eyes sake..as always the Greek Mythology (and the Hellenic religion, as well does are based on HISTORIC facts & thus creating an ultimate pedagogical & philosophical-poetical era) dramatises in epical manners all these facts….if since some thousand years later has been grotesquely copied, and named…as …the “Old Testament”……. Troy (or Ilion), is the city-theater of the Trojan war, part of which is described in Homer’s Iliad. An ancient epic, the 9th or 8th BC century. (Iliad means “epic of Ilion”). The beginning of the story of the Trojans mixes with myths and legends. According to Greek mythology, the Trojans were ancient people of the city of Troy in the region of Troas, in the country of Phrygia, in the land of Asia Minor. Troy was known for its riches, which won by the port trade with east and west, the beautiful clothes, iron production, and massive defensive walls. The royal family of Troy goes back to Electra and Zeus, parents of Dardanus. Electra nursed the Dardanus in the palace on the island of Samothrace. The king named the Trojans he eats people and the country Troas, from his name. The Ilos founded the city of Ilion attaching to his name. Zeus gave LiCl the Palladium. Poseidon and Apollo built the walls and fortifications around Troy for Laomedon, son of the younger group. When Laomedon refused to pay, Poseidon flooded the country and demanded the sacrifice of Isioni a sea monster. Eneskypse horse and sea monster snatched the people of the plain. A generation before the Trojan War, Heracles captured Troy and killed Laomedon and his sons, except for young Priam. Priam later became king. During his reign, the Mycenaean Greeks invaded and captured Troy during the Trojan War. Both Trojan and the Mycenaean civilization destroyed. The Trojans Aeneas, Brutus, and Elymos escaped destruction and were founders Alva Long (neighboring city of Rome), Britain, and Elymos, a country of Sicily. 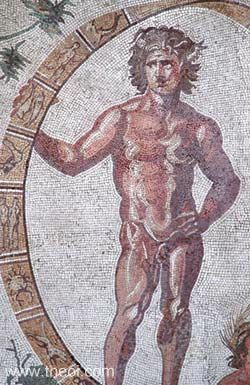 The Maxyanoi was a tribe in western Libya claimed to be descendants of the Trojans, according to Herodotus. The Trojan ships metaforfothikan to Naiades, who rejoices to see the shipwreck of Odysseus. The Homer (Iliad) is one of the Homeric epics and preserved until nowadays. The composition, which according to tradition was made by Homer, placed in the 8th century BC and based on tradition oral composition and recitation of heroic poems that had developed in previous centuries. The poem, which describes some events of the tenth and final year of the siege of Troy (Ilion) by the Achaeans, written in hexameter and has 15.692 verses. Some time after creation, during the Hellenistic period, was divided into 24 rhapsodies (capital) and small changes came in this form nowadays. Each of the rhapsodies indicated by a capital letter of the Greek alphabet, while the rhapsodies of the Odyssey with a small. 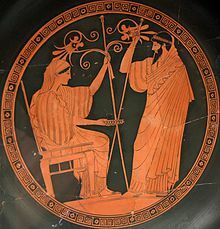 The Homeric epics with the Orphic is the oldest surviving texts of ancient Greek literature in ancient Greece was considered the most important works, and used in education. 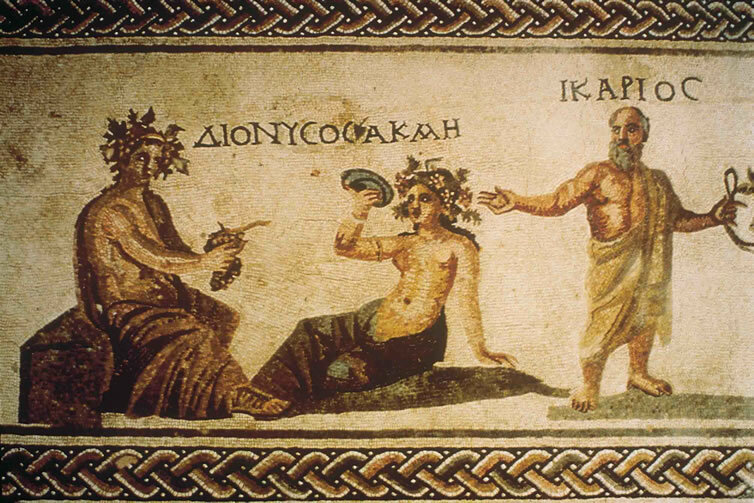 As the main theme of rhapsodists, their recitation was a key part of Greek religious festivals. The events of the Trojan War which tells the Iliad happening in tenth year of the war and unfolding in about 51 days. Top of the poem is the wrath, the wrath of Achilles, after a dispute with Agamemnon for the distribution of the spoils of the battles, leading to the withdrawal of Achilles by warfare. In the Iliad include events following the departure of Achilles and the successes of the Trojans, the entrance of Patroclus in the war with the armor of Achilles, the death of Patroclus, the return of Achilles in the battle for revenge, the death of Hector and the desecration Achillea.Telos from the tradition of the dead the Trojans Hector for burial. The episodes that have preceded ten years of war and the history of war, included in the Cypria, and the events after the burial of Hector until the fall of Troy contained in subsequent projects the Trojan cycle, Negress, Little Iliad, Ilion persita. On the first day of action, the Trojan Chrysis, priest of Apollo and father of Cressida, captive of Agamemnon, came to the camp of the Achaeans and called for the release of his daughter. But Agamemnon was adamant and challenging brutally priest, who prayed to Apollo to avenge this unacceptable behavior (hubris). Apollo responded and punished with ruinous plague the Achaean army. After nine days of illness, convened meeting of the army requested by the seer Calchas to reveal the cause of the anger of the gods. Agamemnon initially refuses to return the girl, intense wrangling with Achilles and finally persuaded to return as long to get to return one of the spoils of Achilles, the Briseis. Achilles is forced to retreat, but offended refuses to continue to fight and begs his mother, Thetis, to ask Zeus to enhance the Trojans in battle to punish the Achaeans. The meeting of Thetis with Gods delaying her son’s desire for twelve days, because Jupiter is absent in the country the Ethiopians. 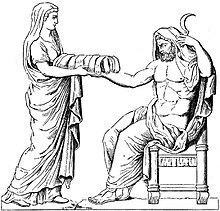 In the second rhapsody, Zeus sends a dream to Agamemnon to stimulate attack of the Trojans, misleading information that the gods support Achaeans. Agamemnon calls a meeting after disagreements Achaeans prepared for battle. When the Trojans informed and they start the preparations. Such events inserted the list of opponents forces and Greek ships. The two armies decide to judge the outcome of the battle in a duel between Paris and Menelaus. Menelaus prevail, but Aphrodite rescues Paris. Opponents decide a truce, but the gods to Assembly decide to cause the violation by the Trojans to continue the war. The battles begin, stands out the presence of Diomedes injuring even the god Mars, the two sides have significant losses, but the Trojans are in a difficult position. Hector temporarily leave the battle to ask the Troades make supplication to Athena. When he returns, he duels with Ajax(Priamos of Troja was his uncle, Hisione was the syster of Priamos), but there is no winner. Hostilities stopped because it gets dark (that day covered the rhapsodies B through H) and decided truce for burying the dead, while the Achaeans strengthen the walling of the camp. In rhapsody I described another day battles, in which the Trojans prevail, and the next two the night following the battle in which the Achaeans asking unsuccessfully Achilles to return to war. The Rhapsody Av begins with new battles. Although initially distinguished Agamemnon and repels the Trojans to their walls, the gods encourage Hector and since then injured many heads of Greeks (Agamemnon, Diomedes, the doctor Machaonas), the Trojans go, pushing the Achaeans in retreat and pull down the walls of their camp (rhapsodies L and M). 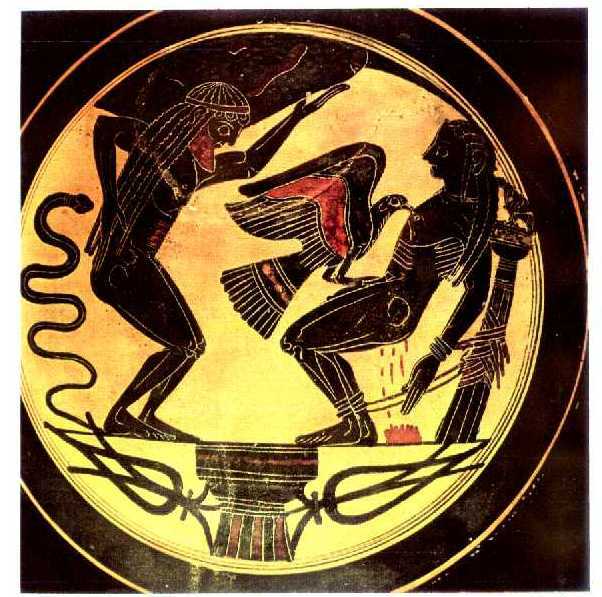 On rhapsodies N-II continues the battle around the ships of the Achaeans, who are in dire straits. Then Patroclus persuaded Achilles to give him his arms and let him lead the army of Myrmidons to deceive the Trojans and curb their enthusiasm. The rhapsody II continues with the entrance of Patroclus into battle. Despite the advice of Achilles confine itself to remove the Trojans from the camp and do not hunt up the city, Patroclus fights and chases up the walls, where only the intervention of Apollo was able to repulse the attack of the Achaians. During conflicts Patroclus, on the enthusiasm approached several of the city walls, followed duel with Hector, who killed him with the help of Apollo. 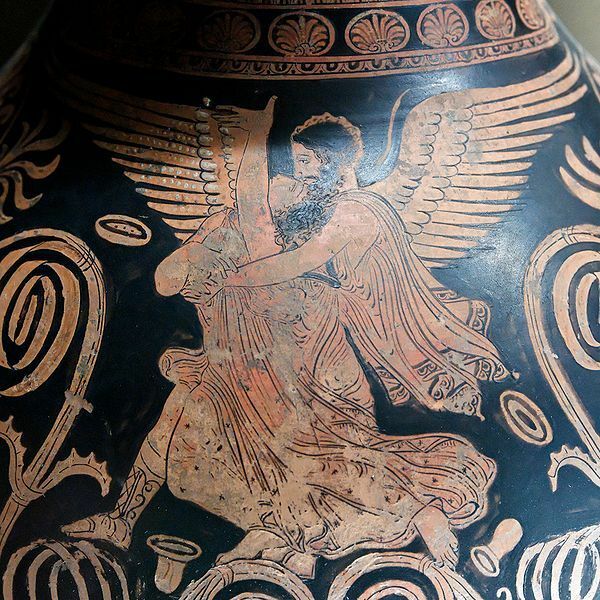 In Rhapsody P is the battle for the body of Patroclus, in which Menelaus distinguished. Eventually Ajax manages to dislodge the dead from the Trojans, but Hector holds his armor. 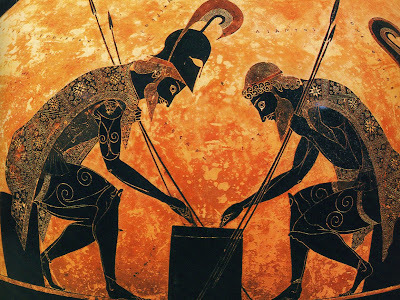 Wearing the armor of Achilles, Hector tries again to get the body of Patroclus, without success. In Rhapsody S. Achilles mourns the death of his friend and decides to avenge him. 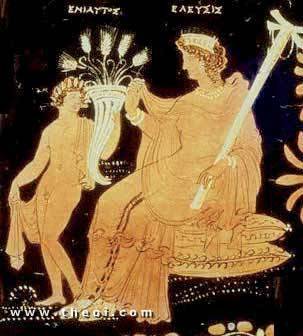 Thetis asks Hephaestus to build new weapons and Rhapsody ends with the extensive description of the shield made. In Rhapsody T Achilles receives new weapons and calls a meeting of the Achaeans. Reconciles with Agamemnon, since both admit they were driven to conflict by divine intervention, and returned Briseis, whom Agamemnon swears that he had touched. After the assembly Achilles mourns Patroclus departs for battle. In Rhapsody Y conflicts begin, involving and gods. Achilles duel with Aeneas, saved by Poseidon. Achilles fought with the river god Scamander and chased the Trojans to their walls (rhapsody F). The Trojans fled the city, except for Hector, who remained on the battlefield to confront Achilles (rhapsody X). Athena misled the promised help, but ultimately supported Achilles manages to kill him. Achilles refuses to hand over the Trojans Hector. Instead, they tie him to his chariot and drags. The Rhapsody ends with the lamentations of the family of Hector. In the days after the death of Hector Achaeans completed the funeral rites for Patroclus, burned his body and organized competitions in honor of (rhapsody Y). The last rhapsody starts with twelve days desecration of the corpse of Hector by Achilles. 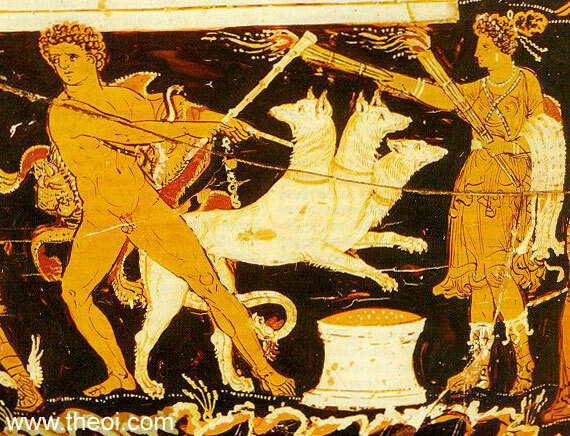 The twelfth day the gods make meeting and send Thetis to persuade Achilles to deliver the dead and Iris motivate Priam begging Achilles. The evening the meeting of Priam to Achilles, who accept the ransom and return the dead and decided truce for the ceremony of burning. Here are ten days laments and preparations and eleventh day is burning and burial of Hector, in which the project ends. 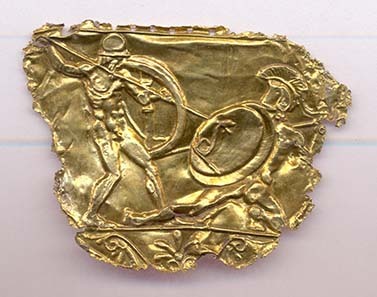 Parts of the Phillip ivory shield that found in Vergina Tomb. You can see clearly the two Pan-Hellenic symbols: The 16th Sun/Star (Vergina Sun) and the Meander (Greek key). The shield itself can be found in the museum of Vergina in Central Macedonia, Greece. Greek Sun/Star or Vergina Sun/StarThere are many other symbols which use the rayed star (the ancient Greek symbol) across the centuries. The ancient Greek stars can contain 3-rays up to 24-rays, and all rays have many shapes, according to their inner meaning found in archaeological monuments. Many ancient archaeological findings exist today, such as ancient Greek coins, texts, icons, emblems, tituli, ostraca, fragments, epigrammata, papyrorum, tablettes, recensios, sculpures, vases, monuments etc. which make use of the ancient Greek rayed star symbol. Even Achilles (Alexander`s the Great Idol) has the rayed star on his armory – as well as many of the ancient Greek gods and goddesses. Achilles was (900 years later) the idol of Alexander the Greatand Ajax (who was nephew of Priamos! Asioni – Ajax mother was Priamos sister). The artistry of execution, strength of conception and restraint of colouring all denote an artist of great talent (perhaps Nikomachos = Battle winner from: Niki+Machi..ex: Andromache of Troja – one of the Doughters of Priamos) of the mid-4th century BC; this dating is supported by the sherds of pottery found in the interior of the tomb. Alexander’s father, Philip, won several equestrian victories at Olympia and Delphi, the two most Hellenic of all the sanctuaries in ancient Greece where non-Greeks were not allowed to compete. Even more significantly, Philip was appointed to conduct the Pythian Games at Delphi in 346 B.C. In other words, Alexander the Great’s father and his ancestors were thoroughly Greek. 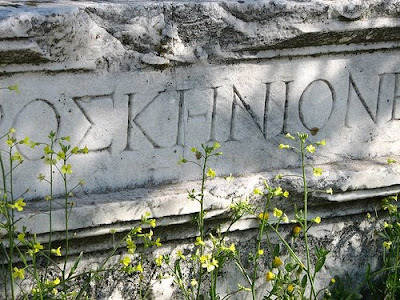 Greek was the language used by Demosthenes and his delegation from Athens when they paid visits to Philip, also in 346 B.C. The traditions of ancient Paionia could be adopted by the current residents of that geographical area with considerable justification. But the extension of the geographic term “Macedonia” to cover southern Yugoslavia cannot. Even in the late 19th century, this misuse implied unhealthyterritorial aspirations. 332 signatures as of June 22nd, 2009, that were sent with the update. The original letter sent on May 18th, 2009, had 200 signatures. 5-67 Head of Alexander the Great, from Pella, Macedonia, ca. 200-150 B.C. Marble, approx. 1′ high. Archeological Museum, Pella.
. Silver tetradrachm minted by Philip II of Macedon. obverse: Zeus. ca. 340 BC. Prometheus – (/prəˈmiːθiːəs/ prə-mee-thee-əs;Greek:Προμηθεύς [promɛːtʰeús], meaning “forethought”) is aTitan in Greek mythology, best known as the benefactor who brought fire to mankind. 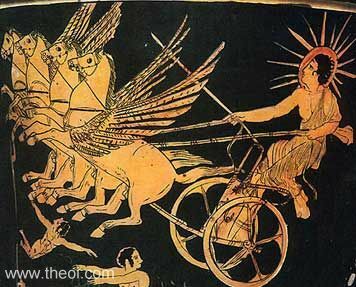 Prometheussided with Zeus and the ascending Olympian gods in the vast cosmological struggle against Cronus(Kronos) and the other Titans. Prometheus was therefore on the conquering side of the cataclysmic war of the Greek gods, theTitanomachy, where Zeusand the Olympian gods ultimately defeated Cronusand the other Titans. According to linguistic theory, an “alphabet” is defined as “the sum of symbols following a specific sequence and order used to ascribe the essential utterances of a language, under thecondition that each utterance represents only one symbol and vice-versa”. Consequently, in alphabetical script (as an example, in the writings of the people of Europe, America, Australian, as well as the other parts of the world) each letter represents one essential sound.This is not true for the imperfect alphabets expressed through syllables where each symbolrepresents a syllable (with two or more voiced sounds). For example, in Greek Linear A andB, there is a symbol that represents the syllable ko (k + o), a symbol that represents the syllable po (p + o), etc. In Phoenician writing (which has only consonants and no vowels), this situation is even worse, as far as we can tell from the small amount of existing samples. So, professor G. Babiniotis’ statement that “Phoenician writing is something like a syllabic alphabet” must be rejected and replaced with the correct characterization of Phoenician as a “purely concise syllable system of writing,” as stated by the former president of the Greek Society of Philologists, Pan. Georgountzos (see “The Alphabet: A Greek Discovery” by Pan. Georgountzos, Davlos, issue 142, October 1993, page 8242). While the house-of-cards which provided “proof”‘ of the so-called “Phoenician alphabet” was being torn down by archaeological discoveries, another overwhelming piece of evidence surfaced. This evidence was offered to us by the 20-year long discreet and timid research of the Greek Language and Writing by a great researcher, Elias Tsatsomoiros. Unfortunately E.Tsatsomoiros passed away on December 19th 1991, after having, however, completed his revolutionary work, History of the Genesis of the Greek Language-from the hunter-gatherer to the time of Zeus-the Deciphering of the Greek Alphabet. The undersigned [writer of this article] had the honor of publishing and editing this work (Davlos Publishing, 1991), but also the honor of having worked closely with the researcher for more than a decade. We had long discussions on the numerous problems arising from the research, and we had published a series of articles in Davlos magazine. This memorable researcher proved in a remarkable way that every letter of the Greek alphabet contained a consistent code meaning, which is literally introduced either exactly or metaphorically within the general meaning of the Greek word it belongs to, as a partial meaning. Consequently, every (ancient) Greek word is basically an acronym (similar to D(imosia) E (picheirisi) H(lektrismou) [=ΔΕΗ in Greek, or as U(nited) N(ations), in English], where every letter provides a significant or less significant notional element, and then, they all together provide the logical definition of the meaning expressed bythe word. The “significant difference” of each word’s meaning is usually provided by the firstletter. Obviously, there is not enough space in this article to present the code meaning of the letters of the Greek alphabet as a whole, as they are analyzed in this revolutionary volume of research in the field of human speech. As an example, I will choose only one of the 24 letters of our alphabet, “Ypsilon” = “Y” or, small case, “u” (pronounced, long-e “eepsilon,” the 20th letter of the Greek alphabet, and familiar to us as “Y” in the so-called “Latin” alphabet– which is nothing more than a variationof the Greek “Chalcidean” alphabet). Ypsilon, therefore, as its shape indicates, has the code meaning of “a cavity” οr, if reversed, of a “convexity.” This meaning is introduced into the words containing this letter, and sometimes, by extension into the meaning of liquids (which, through their natural flow end up filling the “cavity”). I will quickly mention some of the names of vessels and liquids (such as the amphiconical κ-Υ-πελλο which is dated back to 2700 B.C. and is displayed at the Heraklion Museum). One may add to the words mentioned there, many others, such as kot-Y-li, go-Y-ttos, tr-Y-blion, p-Y-xis, amphore-Y-s, b-Y-tion, l-Y-chnos, procho-Y-s, ske-Y-os, etc, all having the meaning of a curvedobject. Also, some other words such as k-Y-hsis (rounding of the stomach ofan eng-Y-os [pregnant] woman); k-Y-ma (curving on the surface of the ocean); cr-Y-pti (curving of the ground); the preposition [h-Y-po] Y-po (meaning under a certain level); h-Y-per (preposition meaning above acertain level); Y-psos =height; and all of the hundreds of words that have h-Y-po or h-Y-per as a prefix, as well as thousands of others. 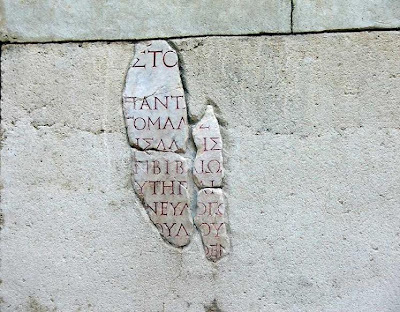 This discovery, which unfortunately has been officially ignored, is a continuation of the forgotten Platonic approach to the problem of language (see Plato’s Cratylus ). 1. Completely rejects the that the Greek language came from another language (the so-called“Indo-European”!!! ), since it is proven to be the only non-conventional language of the world. In other words, the only language where a relationship betweenthe “word” (as a form) and the “meaning of the word” is established. The “Phoenician Theory” was established in Europe during a time, when, as the renowned British classical scholar, S. G. Rembroke (The Legacy of Greece, Oxford University Press, 1984) wrote, “The Phoenicians were given an intermediary role “that is not based on any historical information”. A role, in other words, of the transporter of wisdom and civilization from the “chosen” people of Israel to the “uncivilized” nations, and specifically the Greeks. This, of course, could be forgiven, since this was established around the end of the Medieval Ages, when religious fanaticism and backwardness had reached such a point that the daughter of Agamemnon, Iphigenia, is presented as the daughter of Iephtha; Deukalion is presented as…”Noah”(!! ); Appis is a consul of Joseph; Apollo, Priam, Tiresias, and Orpheus are corrupted alias HYBRIDES personae of Moses. The story of the Argonauts is the crossing of the Israelites from Egypt to Palestine, and other similar distortions. The above are noted by Rembroke. NO matter how different Mishellenic(=Greek hating) & Anthhellenic(Antigreek) Evil & Dark powers, who lead the media towards to blind & uneducatated main stream, who, is the BIGEST victim of all! (“History Chanel, Politicians..etc…the: NEW(!!!) Historical Identity for “Macedonians”, who spealk Wardaskian slavic, Turkish, as ….ancient Trojans(!!!!!! )..but the Temples, the religion, the Etymology, the Philosphy, the Poetry, the Astronomy, the Drama & Theater , the mathematics, names, the REAL Histrorical facts, the LOGICAL CONTINUATION (& Conection of the Language to the: mathematical, architectical, poetical, rythmical, orthological inTime & FACTS is more than ENOUGH to reveal who`s who in the..ZOOO & for NOT understanding characters with NO so much of I.Q, is just very tragic! He wrote a number of works both in prose and verse, of which two survive complete. The longest, Theriaca, is a hexameter poem (958 lines) on the nature of venomous animals and the wounds which they inflict. The other, Alexipharmaca, consists of 630 hexameters treating of poisons and their antidotes. Nicander’s main source for medical information was the physician Apollodorus. Among his lost works, Heteroeumena was a mythological epic, used by Ovid in the Metamorphoses and epitomized by Antoninus Liberalis; Georgica, of which considerable fragments survive, was perhaps imitated by Virgil. The works of Nicander were praised by Cicero (De oratore, i. 16), imitated by Ovid and Lucan, and frequently quoted by Pliny and other writers (e. g. Tertullian in De Scorpiace, I, 1).